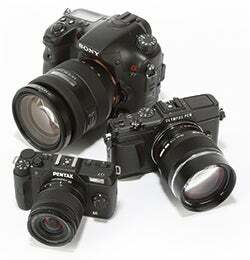 What are compact system cameras? Once upon a time, if you wanted to buy a digital camera you’d have the choice of a compact, a bridge (a compact with a high-magnification zoom) or a DSLR. The step up to a DSLR was a big one, literally. DSLRs are much bigger than compacts not only because they have much larger sensors, but because the viewing system that defines them as DSLRs – a 45° mirror reflecting up to a prism assembly and viewfinder eyepiece – takes up a lot of space. Panasonic and Olympus were the first to realise that if you did away with the DSLR’s optical viewing assembly you could still have a large sensor, and interchangeable lenses, but the camera could be much smaller, and the lenses could be smaller too. In 2008 Panasonic’s Lumix G1 was the first camera with a DSLR sized sensor and interchangeable lenses to dispense with the mirror and prism, and swap the optical finder for an electronic one. Compact System Camera (CSC) tends to be the most popularly accepted term for cameras like this. MILC (Mirrorless Interchangeable Lens Camera) or simply ILC, or just “Mirrorless” are also used, as well as “hybrid cameras”. Whatever they’re called, every manufacturer now has at least one such camera of its own, with an accompanying range of lenses, but the original aims of the first CSCs – to provide the image quality and interchangeable lenses of a DSLR, but in a smaller package – no longer necessarily apply, as manufacturers have plumped for a wide range of different sensor sizes all the way up to full-frame (35mm). It’s probably fair to say that today’s definition of a CSC is a camera with interchangeable lenses but no mirror. Some have DSLR sensors, some have smaller ones, some have electronic viewfinders, others have no viewfinder – just the LCD screen. Here we present a round-up of the different systems currently available, and what they have to offer. Compact System Cameras, or hybrid cameras, are designed for buyers seeking a camera that offers lots of creative control, high image quality and the option to attach different lenses, but who don’t usually want the bulk of a DSLR. Some are almost as big as a DSLR but offer a different user experience, due to the camera’s shape and design. Some use a smaller sensor, while we’re also increasingly seeing great feats of design where the sensor is large, but the body remains small for the best of both worlds. Other factors need to be taken into consideration too. Some CSCs use the contrast detect method of focusing, which is slower than the phase detect method used by DSLRs. This can make many CSCs generally less suited to action photography, though there are some exceptions – the Nikon 1 system is blisteringly quick, and a few CSCs have phase detect pixels built into the sensor. Many CSCs have viewfinders, but some offer just an LCD screen, which can make them more difficult to use in bright sun. A few have the option of a clip-on EVF at additional cost. Of those with a viewfinder it will be electronic – the technology of which is rapidly improving by the day and some offer incredibly high resolutions. Some cameras with EVFs are styled like mini DSLRs, while others follow more of a rangefinder style. Neither is better, it’s down to personal taste. Finally, consider what other features are important to you. What about video? All offer HD video but bit rates and compression options vary, and only a few offer an external mic input. Some also offer 4K video shooting. If you want Wi-Fi, the good news is that it’s difficult to find a current CSC model without it. Such a feature not only lets you publish online straight from the camera but often also enables you to control the camera remotely with a smartphone. 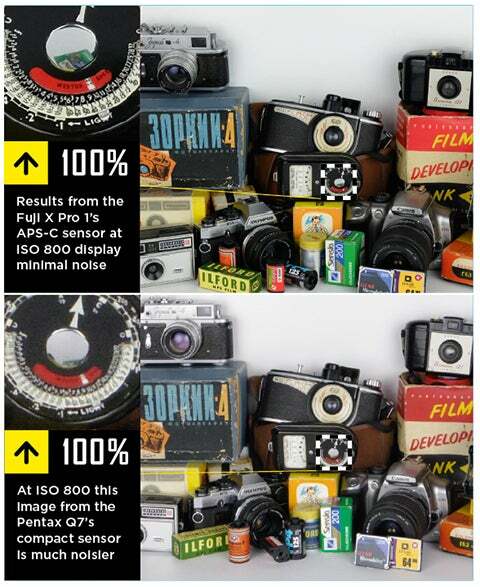 As a very general rule (and there are several notable exceptions), bigger cameras have bigger sensors, which produce better quality images, so choosing a system entails first deciding how important image quality is compared with portability and convenience. It’s now possible to find CSCs or hybrid cameras with sensors ranging all the way up to full-frame (35mm). It should be pointed out that even the smallest cameras are capable of producing high quality images to at least A4 at the lower ISO settings, and it’s only when you go bigger than that, crop heavily, or use high ISOs that the more experienced, critical eye can discern the differences between the systems. So how do the sensor sizes vary between the camera systems? This diagram (below) illustrates the relative sizes of the sensors used by the different CSC manufacturers. The largest, full-frame, is the one used in professional and high-end enthusiast DSLRs, while the second largest, APS-C, is the one used in most consumer DSLRs. The Pentax Q7 uses a small sensor (1/1.7in) commonly used in some higher-end compacts. Canon was the last to launch a CSC and so far has three cameras, the EOS M, the EOS M3, and the EOS M10 which use APS-C sensors – the same size found in many of its DSLRs. The EOS style interface and touchscreen LCD make them easy cameras for Canon DSLR owners to get to grips with and you can attach EF lenses, too, with an adaptor (which is just as well as at present there are only a few EF-M lenses). The downside of using the EOS M is an AF which can’t quite cope with fast subjects (such as sport) and the lack of a viewfinder. 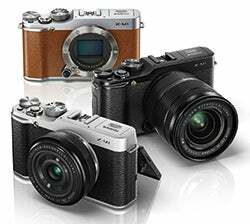 The retro design and styling of the Fuji X range of cameras has won favour with both critics and consumers. If you hanker after a Leica, but don’t have the cash to drop on such a high priced piece of kit, a Fujifilm CSC could be the one for you. Initially aimed most squarely at pros, there’s now a varied range of Fuji CSCs available to meet most different consumer needs. The current line-up models vary in size and viewfinder type. The X-Pro1 has a hybrid finder that lets you switch between optical and EVF, the XE-2/XE-2S, X-T10 and X-T1 have just an electronic finder, while the XM-1 and X-A1 have no viewfinders at all. All are great for manual control lovers, but auto scene modes and creative filters are there for those who want them. Generally speaking, the X-Pro1 and X-T1 are aimed at high-end enthusiasts (and perhaps even pros), the X-E2 and X-T10 are for mid-range users, while the X-M1 and X-A2 are aimed at those new to hybrid cameras. The range of Fuji X mount lenses is also growing at a rapid pace. The Nikon 1 system is named for its one-inch sensor. Although much bigger than most compact camera sensors, it’s a lot smaller than a DSLR’s, but this makes the camera and lenses very small. The system is packed with ground-breaking technology, such as the ability to shoot full resolution shots at 60 frames per second, shoot video and stills simultaneously, and even begin capturing images before the shutter is fully depressed. The V series (currently the V3) is the only model in the range with a built-in EVF. Action and adventure fans may be tempted in by the AW1, which offers waterproofing – along with a range of lenses to go with it – so you can take it underwater. Things have gone pretty quiet on the Nikon 1 front lately. Olympus plundered its back catalogue for inspiration in its CSC design, with two retro-styled lines: the PEN series, based on the classic 1950’s half frame PENs, and the OM-D, based on its classic OM film SLRs. The OM-D models offer a built-in EVF while most of the PENs do not (though some accept an optional add-on one, and the newest, the PEN F has one inbuilt). All use the same MFT format sensor as Panasonic, and the MFT lens mount, which enables all Olympus, Panasonic and third-party MFT lenses to be attached. Panasonic’s extensive range of CSCs fall into four categories: DSLR style (GH4, GH3, G7, G6) compact style (GF6, GF7), rangefinder style (GX8, GX80, GX7) and ultra-compact (GM5, GM1). Panasonic makes widespread use of touchscreen technology, enabling users to select focus points anywhere on the screen, and even fire the shutter release from the screen. All of its models offer Wi-fi that lets you control the cameras remotely, and some also include NFC. Panasonic has the biggest range of its own CSC lenses, and the MFT mount has by far the widest support. The ultra-small GM5 and GM1 models are smaller than most of the Nikon 1 range of CSCs, but have a much bigger sensor. Ricoh Pentax used to have a few compact system cameras in its line-up, but at present, it just has the Q-S1. It features the smallest sensor of all the compact system cameras, at just 1/1.7 inch – that’s the same as some compact cameras so you can expect similar image quality. You can change the lenses, and the system is ultra small, but it’s fair to say that the other CSCs are generally better regarded. Lenses in system: 11 full-frame, 17 APS-C, plus A-mount adapter and third party optics. Sony is the only manufacturer to offer a full-frame CSC at present. The a7 series have been met with much praise, and offer ultimate image quality in a much small body than your average full-frame DSLR. The company also has APS-C offerings, all of which tend to follow a compact style. There’s also the QX1, a slightly stranger concept – it’s an APS-C size sensor camera, but there’s no screen… you use your phone instead (but you can still change lenses).